Dr. Who has been a science fiction favorite since it's premiere in 1963. There has been 11 different incarnations of The Doctor. One of the most recognizable is the fourth Doctor with his long multi-colored scarf. This 6' long scar is perfect for dressing up as the 4th Doctor from Dr. Who for Halloween or science fiction conventions. 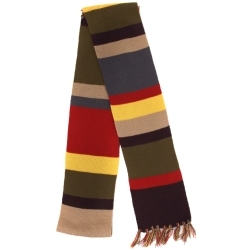 The Dr. Who the 4th Doctor scarf is colored as pictured. Scarf measures 6' long.